Preparing for a really long trip to the other side of the galaxy really needs a little thought, as there wont be any stations out there to drop in do a quick repair or refuel. 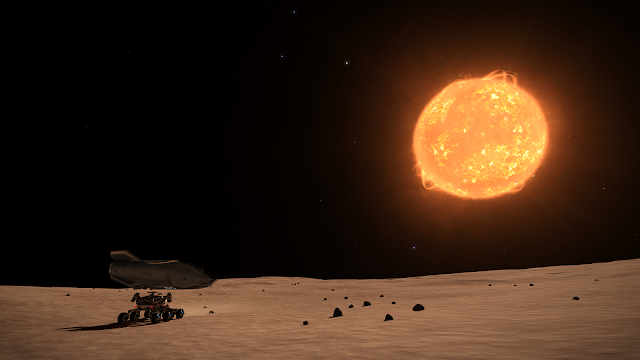 The bubble, as we call it is very tiny and in an ASP with a jumping distance of 30+ light years, it doesn't take long to get from one place to another. 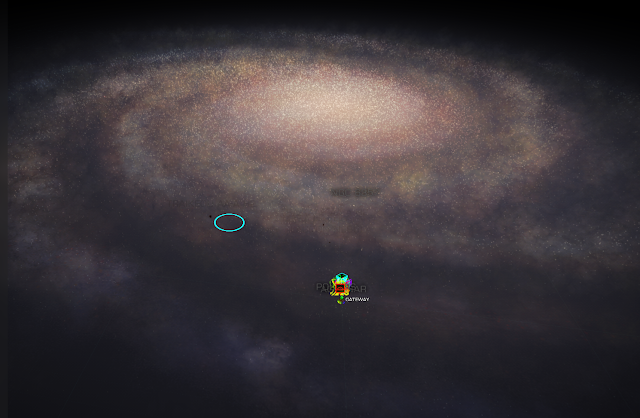 Elite Dangerous makes the very valid boast of having over 100 million stars. Looking at this galaxy map it is quite believable. The blue circle is just a helper to show you where your effective cursor is located, and the bubble? well, its that little cluster of colours. So you can see there is a lot of exploration to be done and I have read somewhere, that only a couple of percent of the galaxy has been explored, despite the game having been out for quite a while now. 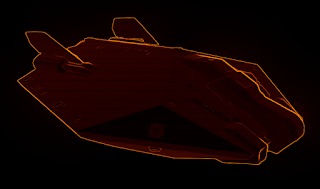 As mentioned earlier I will be using the ASP Scout for this trip. 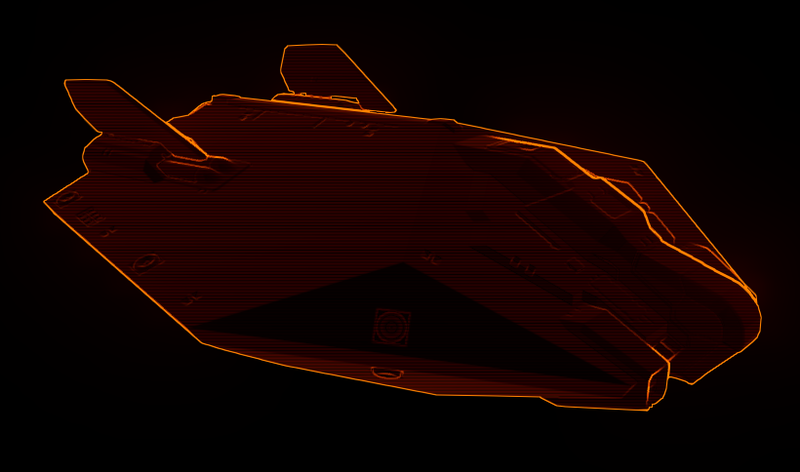 It is much larger than the Cobra and takes a little getting used to. One of its best assets is having large windows. When landing on a planet, the window which lies between your legs, although partially covered by the SRV interface, does allow you to peer down and look for a suitable area when hunting materials, especially when still in cruise mode before you drop into the glide. Hitting the right spot on a planet really does help the frustration factor when looking for certain materials. 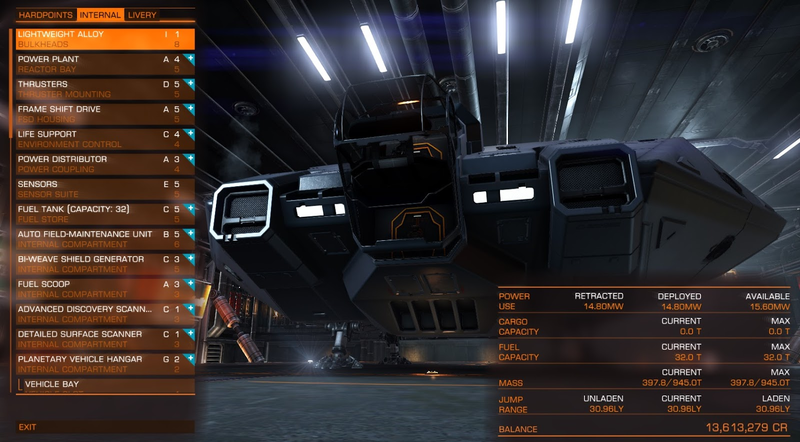 My current load-out is not the best it could be, but combined with FSD injection, I feel the range is OK. The bi-weave shields are a little lighter than standard ones. Theoretically, I should remove them altogether, but I like to see the blue rings around the ship hologram, and gives me more confidence in the ship. I know it is psychological as there are no NPCs' outside the bubble, but its coming back to sell the data that I am little apprehensive about. If you loose your ship, you loose all your data and the whole trip would have been a waste of time. I could also remove the docking computer too, but I do like it and use it all the while. To be honest, the extra tenths of a light year increase when it is removed. makes no odds to me. The screen shot below shows the load-out and available jump range. There are 2 slots not shown below. These are the docking computer and planetary suite. I am sure it can be improved upon. With regards to the hardpoints, there is just the slot being used, again to increase my confidence factor; an A 0 Shield Booster. I don't need any weapons as I wont be shooting anything; I can do that in the SRV if I really feel the urge. Synthesis is the part that you can leave out altogether, or like me, you want to be prepared for some eventualities. You may have noticed the AFM in my load-out. I am not worried about speed, but the main concern was mass vs. repair capacity. The question you need to ask yourself, what if things started going horribly wrong and you ran out of charges? This could be a nightmare situation, but thankfully synthesis comes into play here. You can create a number of charges if you have the materials. Surely a life saver! These would all be of the basic variety, however I thought it would be rather nice to have all flavours of the FSD Injection. This is where the planning and preparation really comes into play. I had been collecting various materials for a while so I had enough for a few of these, but not all. Time to make a spreadsheet and fiddle with some numbers. 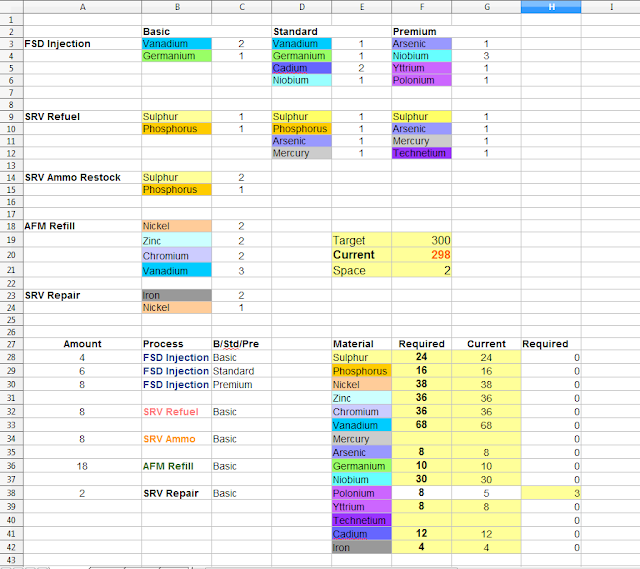 Now this spreadsheet is quick and dirty, and I only threw in a few colours to tart it up a little, so this could be improved upon a lot. As you can see, it really is pretty basic, but what it allows me to do, is to tweak the amount charges for each synthesis and the spreadsheet updates all the material counts and how much space it will take up. Those of you that have actually read down to here will notice that I still have 3 Polonium to find. This is one material that seems to be rarer than the very rare, It can only be found on planets that support certain conditions, that are in certain terrain types, and only in metallic meteors. All the materials collected have so far been inside the bubble, but I think there is a much better chance of getting Polonium when further out into the galaxy core. I seem to remember that the most boring part was finding Vanadium; after all the list says I need 68, and it is not that common. Playing a few hours a day, getting this shopping list together has taken about a week, but I now feel very confident that I can replace what I use, but having a nice buffer to play with in the first case. So..... that is pretty much the preparation dealt with. All I need to do now is to start thinking about the route I want to take and planning some waypoints. A very hot tiny rock!